This week has just been another wet and horrible one, which means that some of our plans have been postponed. It has also been a strange one, with the EU Referendum taking place. I’ve struggled to find 7 interesting things this week as it seems to have just involved going to work and getting rained on. As always, thanks to threads and bobbins for organising Sunday Sevens. 1. I’m going to get this out of the way. My blog is not a place where I want to bring masses of politics, nor am I going to disclose which way I voted. However the referendum has been such a major part of this week for the whole of the UK that I couldn’t not mention it. We are lucky that we live in a democracy, a place where your opinion (in the form of a vote) counts. That means that as long as we have exercised our right to vote we have done as much as we can. Part of being able to vote means that we might not always get our own way. As more and more emerges about the truth (or lack of) behind both sides of the campaign we are left feeling betrayed and many are deeply concerned about what happens next. We now just have to have faith and positivity in the way forward and basically just get on with it. The future is always an unknown entity and being unkind and bitter towards one another is unlikely to make that path any less bumpy. 2) On a lighter note I was very pleased to see my little blog had been nominated for the Liebster Award by a fellow blogger. It’s nice to know others enjoy reading as much as I enjoy writing. 3) What was left after my little game of yarn chicken. It’s not the closest I’ve been to running out halfway through a round but it was a little nerve wracking. Not sure I’d have been happy if I’d had to frog a whole round of over 200 stitches! 5) My order of Ice Yarns arrived. I have no idea what I’m going to make yet but it is lovely soft yarn. If there was more of it I think I’d have to roll around in it as it feels so unlike other acrylic yarn. Since there are only 4 balls though I will refrain from doing that as I’d look a bit silly! 6) Proudly presenting my latest culinary invention. Picture the scene: it was Saturday morning and I thought I’d make a Slimming World cooked breakfast as I had nothing else planned. I fancied a fried egg with it so I sprayed the pan with fry light and cracked the egg into the pan. That was the first fail as the yolk broke. I let it cook for a minute and it spread out further so I used the spatula to scrape it back into the middle and then thought ‘stuff it, I may as well stir it now’. That was the point at which ‘the frambled egg’ was born. Despite it’s grim appearance it actually tasted pretty good. I won’t be holding out for a place on Masterchef though! 7) This morning we went to another local village show. It was in a rather bumpy field with ancient trees in it and there were lots of the usual quintessentially British stalls-crafts, tombolas and a lot of cakes! The children both had a go on tombolas and William had a climb, then we watched the egg throwing training for a while. This show is actually the home of the World Egg Throwing Championship, hence the photo! If you want to read more about this link should tell you all you could ever want to know. Thanks for reading my unintentionally egg themed Sunday Sevens! I know someone who always makes her eggs this way, but I don’t think she has such a good name for them! That new yarn looks gorgeous. I think I really might have to put knitting goodies on my wish list again. The yarn looks fabulous! Can’t wait to see what you stitch up with it. 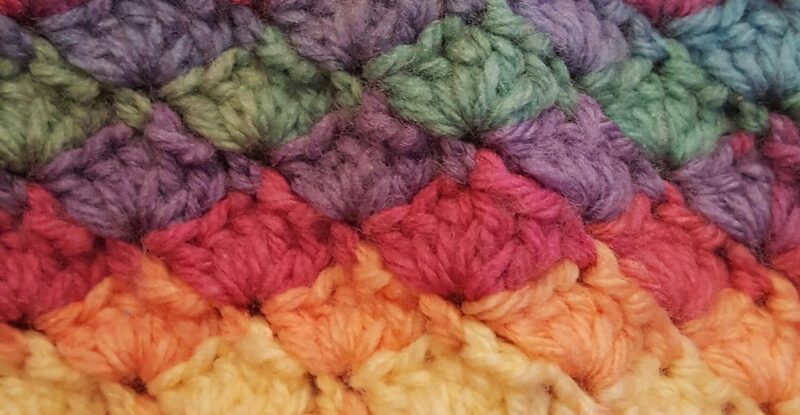 Your crocheted piece is very pretty and will look great with that lovely fabric you have chosen. I hope you win 🙂 Good luck. your blog is just delightful! Someday when I have free time (lol) I will have to try making one of the doilies. I used to crochet with thread, but nothing as beautiful and colorful as the work you do. And I also love the ice yarn. Will be interesting to see how you decide to use it. Thank you for your lovely comment! I am keeping an eye out for lovely patterns that I might use it for. Wow! Definitely a small world, I think I must practically drive past yours on my way to work! It is a lovely show isn’t it? I really like the massive old trees in the show field. I keep considering having a craft stall but I’d have to make a lot of thinks first!